If you haven’t already heard, Santo, Tom and Rob have written a new satire called The Speechmaker which is making its debut on 31 May at Arts Centre, Melbourne. Do pop along if you are there! It runs until 5 July. And we’d love to hear what you thought of it by posting a review on the forum! Air Force One is London-bound for a surprise Christmas meeting between the US President and the British PM. It will be a diplomatic coup, not to mention one hell of a media opportunity – a no-risk vote-winner for the price of a little jet fuel, and the chance for the Leader of the Free World to give the speech of a lifetime. Yet with the seatbelt signs barely switched off, what appears to be a major international crisis begins to unfold. As the stakes rise and the clock ticks, the President and his advisors are forced to make some uncomfortable decisions. 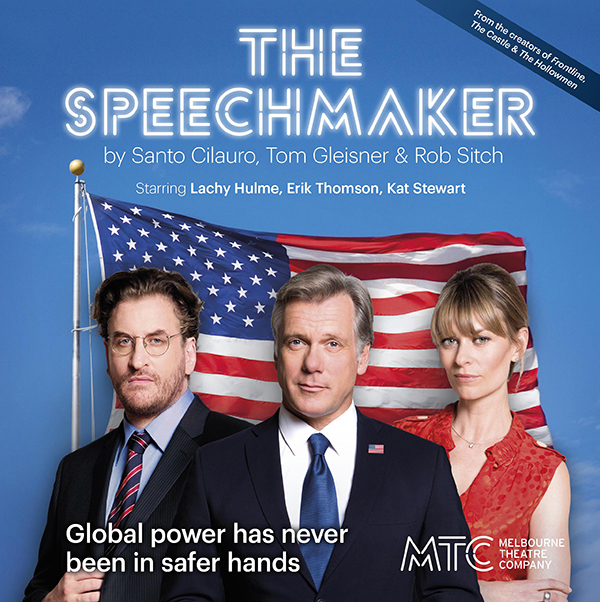 Boasting a stellar ensemble cast featuring Erik Thomson (Packed to the Rafters) as the President, as well as Offspring’s Lachy Hulme and Kat Stewart, The Speechmaker promises to be an exhilarating stage debut from one of this country’s most successful creative groups. Here’s a video of Rob discussing great political speeches of our time on Melbourne’s 3AW talk radio. Did anyone go to see this play? Did you like it?